Finished size - 66" X 78"
I first was inspired to start this quilt after a visit to the Quilt Study Museum in Lincoln, Nebraska during the summer of 2015. They had on display a Tile Quilt as that is what they were classified as. It is easy to understand why these quilts are called Tile Quilt. Upon my return home, while browsing through an antique quilt book, I found another Tile Quilt. 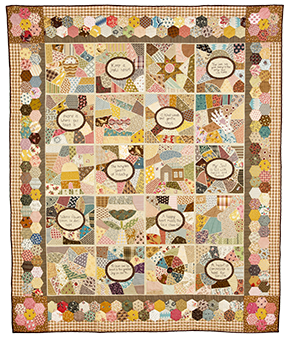 This quilt was made by two sisters from Boston who made the quilt for their sister who had moved away to Connecticut. They named their quilt, "The Streets of Boston", you can understand how appropriate their name choice was. My quilt is called "Wandering Ways", as I have happily wandered through Boston on several occasions. You will receive a starter pack of fabric from the same color scheme as the quilt photo. There will be 75 pieces of fabric the appropriate size to start creating your block designs.